That was exciting. I counted over 40 seconds of motion in Manila. This is a wake up call for all of us, including me. Check back here for updates. I am posting some basic material to begin with. We had another earthquake in this region last year. Here is a page i put together for that earthquake. Don’t forget to get to the USGS online to fill out the “Did You Feel It?” form. The information provided helps geologists and seismologists learn about the ground shaking response for earthquakes in this region. They also can apply this information elsewhere (in some ways). 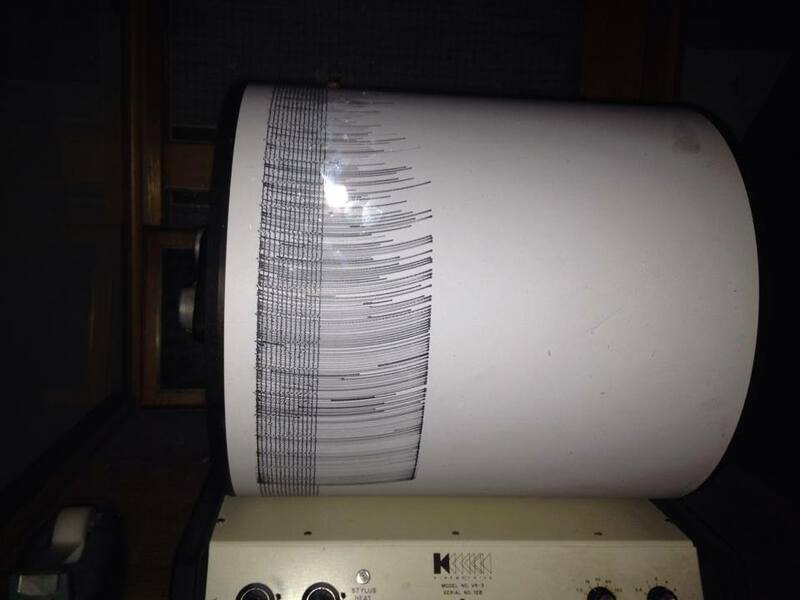 This is most likely an earthquake in the underlying Gorda plate. 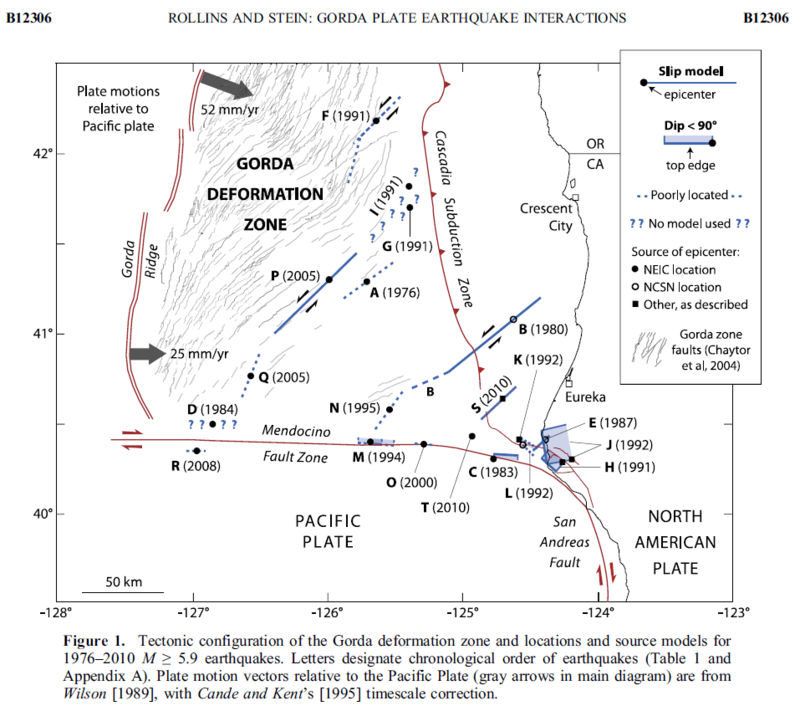 The Gorda is losing the battle between the JdF plate to the north and the Pacific plate to the south, both of which are colder, older, and more dense (basically, they form a vise that is squeezing Gorda so much that it deforms internally). 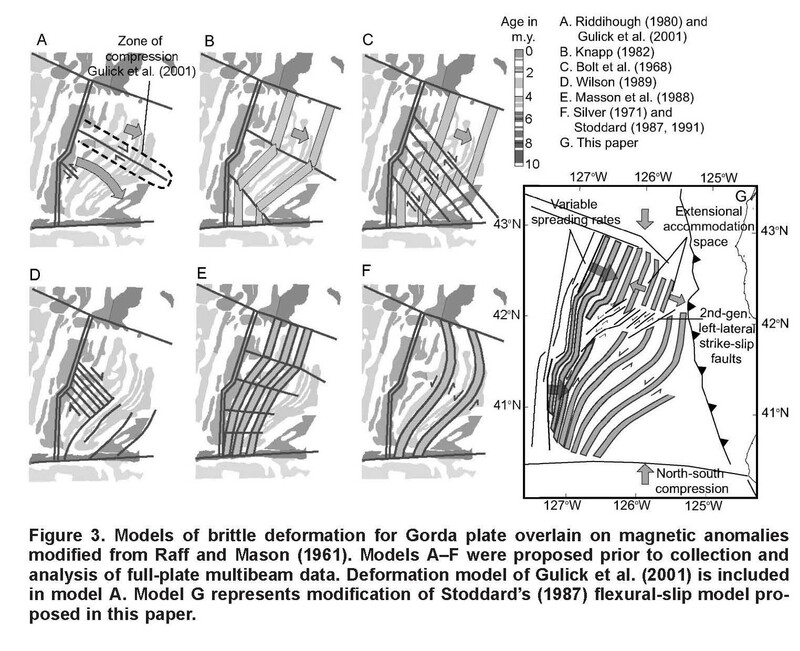 This internal deformation results in the formation of left lateral strike slip faults in the southern GP that form on preexisting faults (originally formed at the Gorda rise, where the Gorda plate crust is created). 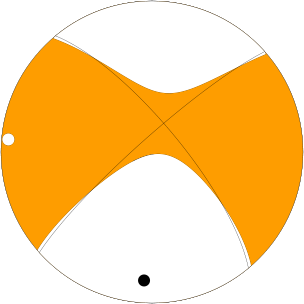 This is the moment tensor, which shows it is either a northeast striking left-lateral strike slip earthquake or a southeast striking right lateral strike slip earthquake. Given what we know about the regional tectonics, I would interpret this to be a left lateral earthquake. It plots just southwest of the 1980 M 7.2 Trinidad earthquake. There was a focal mechanism earlier that matched this moment tensor and then a later focal mechanism that was incorrect. I have removed both of them as the moment tensor is a more reliable measure of the sense of motion on the fault. Here is a map showing historic seismicity. The largest circle to the northeast of the epicenter in orange is the 1980 Trinidad earthquake. Here is a map showing the Modified Mercalli Shaking Intensity for the region. The contours and color over land have the same color scale. 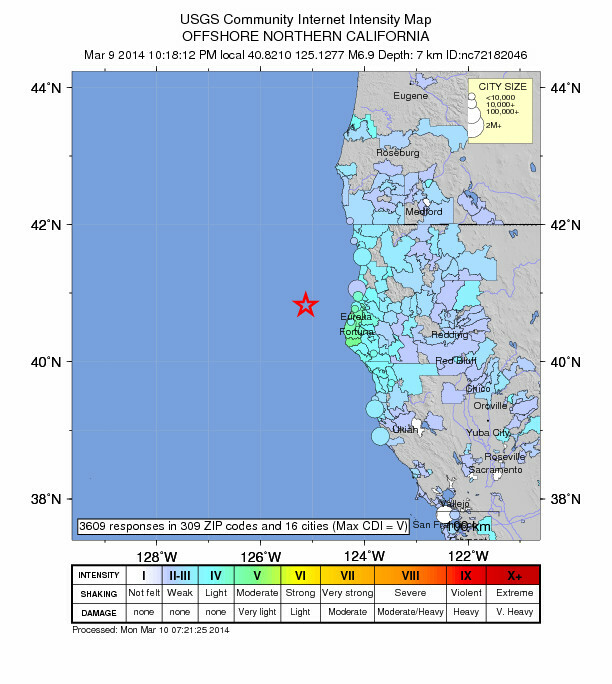 Note the increased shaking in the Humboldt Bay region. This is probably the result of the underlying material here (sediments vs bedrock). Here is the map from the Southern California Earthquake Center (SCEC). 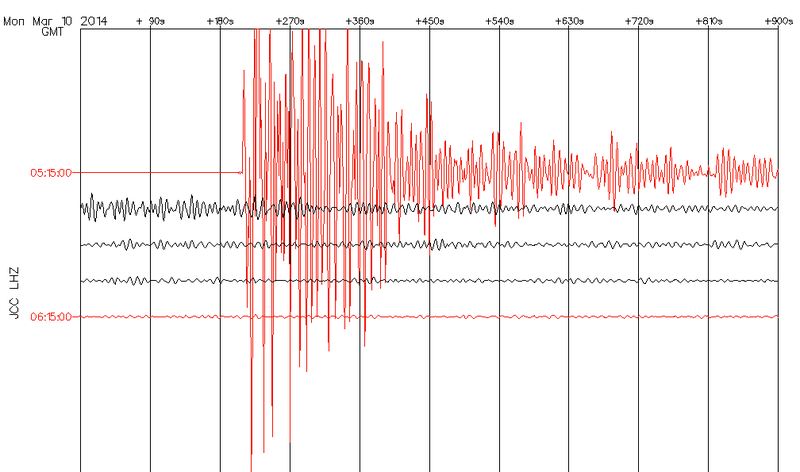 There are several aftershocks in red. There was a M3.3 foreshock. The aftershocks appear to align with the northeast striking faults in this region of the Gorda plate. These are likely triggered earthquakes on different faults than the mainshock (so may not be considered aftershocks, but triggered seismicity). Here is the pager information (shows the potential exposure, economic or human, to the ground shaking). Very clear description J thanks for this! … this was very informative, and timely too! Thanks! Lots of people were interested and I felt it important to get it out asap. I’m glad i was able to do that. Thanks Jay! I knew right where to go to get info on the quake. We felt it in Fort Bragg and I just filled out the form. Nicely done, Jay. will use some of this for discussion in Phys Geog come Tuesday’s presentation. Encouraging those students who are excited by such information to sign up for your “Hazards” course. thanks dan, i hope it helps! Kevin shared this site with me! Great info, especially as I was out of town for this one!! Thanks for the good update! Thanks very much for posting this! It helps a lot to know. If you would, would you mind explaining why the depth of the aftershocks ranged from 0.1 km to around 22.8 km? Why, why, why Mister Patton Science Guy? it is interesting that there are these deep aftershocks. the depths may have significant error since they are offshore… but i am not a seismologist and cannot place numbers on this uncertainty. 0.1 km seems suspicious. maybe that was on a small eq and was not really evaluated much. Thanks for being there with the info, Jay! !